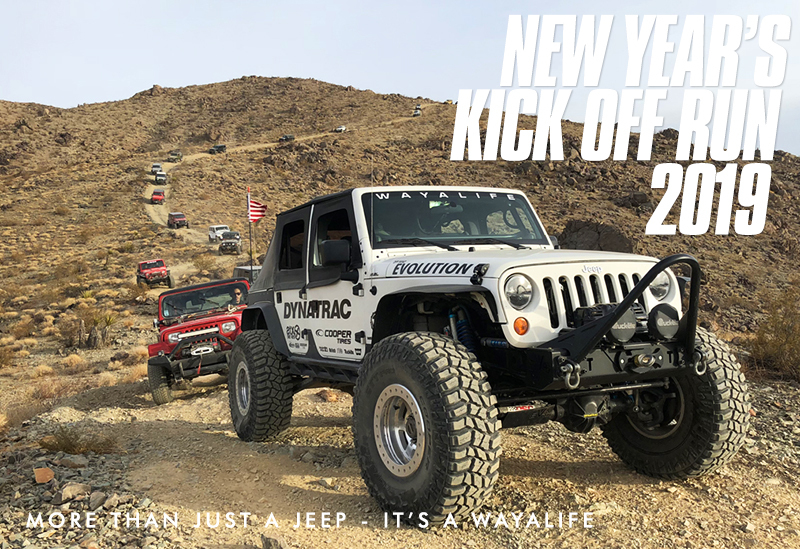 As hard as it is to believe, 2019 is knocking on our door and just as we always do, Cindy and I will be heading out to the Mojave Desert to hook up with our good friends and kick off a brand new year of wheeling! While this will be for the most part, a super easy scenic run, we will have a few minimum requirements that you'll need to satisfy in order to join us. Also, to help keep the group size manageable and fun for everyone, we will be limiting the amount of Jeeps that can attend. Also, while we won't enforce this as a rule, we are asking that people who sign up be an active member here on WAYALIFE or at least, to some minimal degree. It's nothing personal but we're not tour guides and we do this trip for our benefit and for us to enjoy. With that said, please let us know if you'd like to join us for the fun. We will be meeting at a location to be announced, out in the Mojave Desert and near the California/Nevada border. For those of you who are interested, I will provide information by PM regarding the hotel we will staying at on Friday night as well as where we will be staying at after the run on Saturday. As always, this will be an ALL DAY trip that goes well into the night. If you're just planning to meet up with us, please note that we will require you to be gassed up and ready to roll at 8:00 AM. Please be aware that it will most likely be on the cool side all day if not down right cold. Please pack/dress accordingly and in layers just in case it turns out to be nice out. Also, you need to make sure that you bring plenty of water as well as a lunch and snacks for you and everyone in your Jeep. While we "should" be done with this run by sundown, more times than not, things happen out on the trail and you NEED to be prepared for a long night - just in case. You also need to know that restrooms will be on short supply on this trip. I will be sure to stop periodically in a location where it's more advantageous for the ladies to find cover but, that's the best I can offer. Likewise, there are no trash facilities so you need to be sure to pack out what you pack in. Please - NO DRONES. Although it's not a requirement, a CB is HIGHLY RECOMMENDED as it will make this trip a LOT more fun. Last but not least and maybe most importantly, YOU NEED TO PAY ATTENTION TO THIS THREAD. Regular updates will be posted here and I will NOT answer questions by PM. We look forward to kicking off the new year, out on the trail and with all of you! While Cindy and I know some of you well, there are plenty of you who we've never met in person before and if you'd like to sign up for this trip, we are asking that you please post up a pic of yourself and tell us what your real name is. We'd also like for you to post up a pic of your Jeep and tell us a bit about it. Also, just to reiterate, simply signing up will NOT guarantee you a spot on the trip. Your participation on this thread WILL. We are still hammering out the details and there is a chance that we can take on a few more Jeeps. Of course, there are always a handful of people who will drop out as well. If you missed the sign up and would still like to join us, please post up here on this thread and I will add you to our standby list. For those of you who are interested, we will have T-Shirts, Girls Shirts and Hoodies with the official 2019 New Year's Kick Off Run Logo printed on them and available for sale on TeeSpring. Click on the link below to place your order now. To kick things off, here's a pic of Cindy and I although, we'll most likely take JET Li, our 2018 JL Wrangler Rubicon Unlimited instead of Moby. Still deciding. I always look forward to doing this run! Fun with old friends and a chance to make new friends! Count me in! Been waiting since we got home from the last one for this announcement. Wouldn’t miss it for the world.